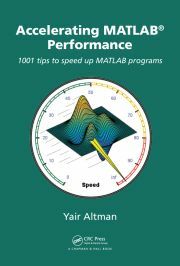 Array preallocation is a standard and quite well-known technique for improving Matlab loop run-time performance. Today’s article will show that there is more than meets the eye for even such a simple coding technique. A note of caution: in the examples that follow, don’t take any speedup as an expected actual value – the actual value may well be different on your system. Your mileage may vary. I only mean to display the relative differences between different alternatives. Memory management has a direct influence on performance. I have already shown some examples of this in past articles here. While this may be simple to program, it is not wise with regards to performance. The reason is that whenever an array is resized (typically enlarged), Matlab allocates an entirely new contiguous block of memory for the array, copying the old values from the previous block to the new, then releasing the old block for potential reuse. This operation takes time to execute. In some cases, this reallocation might require accessing virtual memory and page swaps, which would take an even longer time to execute. If the operation is done in a loop, then performance could quickly drop off a cliff. The cost of such naïve array growth is theoretically quadratic. This means that multiplying the number of elements by N multiplies the execution time by about N2. The reason for this is that Matlab needs to reallocate N times more than before, and each time takes N times longer due to the larger allocation size (the average block size multiplies by N), and N times more data elements to copy from the old to the new memory blocks. A very interesting discussion of this phenomenon and various solutions can be found in a newsgroup thread from 2005. Three main solutions were presented: preallocation, selective dynamic growth (allocating headroom) and using cell arrays. The best solution among these in terms of ease of use and performance is preallocation. => Elapsed time is 0.019954 seconds. => Elapsed time is 0.004132 seconds. On pre-R2011a releases the effect of preallocation is even more pronounced: I got a 35-times speedup on the same machine using Matlab 7.1 (R14 SP3). R2011a (Matlab 7.12) had a dramatic performance boost for such cases in the internal accelerator, so newer releases are much faster in dynamic allocations, but preallocation is still 5 times faster even on R2011a. => Elapsed time is 0.016907 seconds. % A much faster alternative - 500 times faster! => Elapsed time is 0.000034 seconds. The reason for the second variant being so much faster is because it only allocates the memory, without worrying about the internal values (they get a default of 0, false or ”, in case you wondered). On the other hand, zeros has to place a value in each of the allocated locations, which takes precious time. In most cases the differences are immaterial since the preallocation code would only run once in the program, and an extra 17ms isn’t such a big deal. But in some cases we may have a need to periodically refresh our data, where the extra run-time could quickly accumulate. Update (October 27, 2015): As Marshall notes below, this behavior changed in R2015b when the new LXE (Matlab’s new execution engine) replaced the previous engine. In R2015b, the zeros function is faster than the alternative of just setting the last array element to 0. Similar changes may also have occurred to the following post content, so if you are using R2015b onward, be sure to test carefully on your specific system. As can be seen, Variants C-E are about twice as fast as Variant B, and 5 times faster than Variant A. => Elapsed time is 0.008170 seconds. => Elapsed time is 0.000095 seconds. => Elapsed time is 0.004637 seconds. => Elapsed time is 0.012873 seconds. => Elapsed time is 0.002804 seconds. => Elapsed time is 0.000429 seconds. When preallocating structs, we can also use a third variant, using the built-in struct feature of replicating the struct when the struct function is passed a cell array. For example, struct('field1',cell(100,1), 'field2',5) will create 100 structs, each of them having the empty field field1 and another field called field2 with value 5. Unfortunately, this variant is slower than both of the previous variants. When preallocating in general, ensure that you are using the maximal expected array size. There is no point in preallocating an empty array or an array having a smaller size than the expected maximum, since dynamic memory reallocation will automatically kick-in within the processing-loop. For this reason, do not use the empty() method of class objects to preallocate, but rather repmat as explained above. When using repmat to replicate class objects, always be careful to note whether you are replicating the object itself (this happens if your class does NOT derive from handle) or its reference handle (which happens if you derive the class from handle). If you are replicating objects, then you can safely edit any of their properties independently of each other; but if you replicate references, you are merely using multiple copies of the same reference, so that modifying referenced object #1 will also automatically affect all the other referenced objects. This may or may not be suitable for your particular program requirements, so be careful to check carefully. If you actually need to use independent object copies, you will need to call the class constructor multiple times, once for each new independent object. Do you have any similar allocation-related tricks you’re using? or unexpected differences such as the ones shown above? If so, then please do post a comment. Elapsed time is 0.005574 seconds. Elapsed time is 0.005813 seconds. Elapsed time is 0.005598 seconds. Elapsed time is 0.005608 seconds. The other examples all worked the same for me as in the post. This is strange! Can you explain why the 2nd variant is only 100 faster the first time around? Only after a ‘clear all’ you get a fast execution again. Elapsed time is 0.020362 seconds. Elapsed time is 0.020228 seconds. Elapsed time is 0.018324 seconds. Elapsed time is 0.000206 seconds. Elapsed time is 0.022243 seconds. Elapsed time is 0.019689 seconds. Elapsed time is 0.020465 seconds. @Chris & Richard: perhaps this is platform or situation dependent. On my Windows XP running both R2010b and R2012a, data1=zeros(1000,3000) is consistently hundreds of times slower than data1(1000,3000)=0. Perhaps you are running this on a “warm” Matlab session that is running on fragmented memory? Try running on a new Matlab session that does not clash for system memory with other heavy processes (e.g. a multi-tab browser). now I’m confused: did you mean slower, by any chance? I can recreate Yair’s differences between data1 = zeros(1000,3000); and data2(1000,3000) = 0; on 32-bit Windows XP 32 with R2010a, but not on 64-bit Linux with R2011a. So it looks like it might be OS or 32/64 bit dependent. Elapsed time is 0.005977 seconds. Elapsed time is 0.000040 seconds. Elapsed time is 0.006443 seconds. Elapsed time is 0.000030 seconds. Elapsed time is 0.006265 seconds. It appears it is faster to preallocate a 1e4 x 1e4 (800MB) matrix than a 1e3 x 1e3 (8MB) matrix. Elapsed time is 0.007353 seconds. Elapsed time is 0.000027 seconds. Elapsed time is 0.007176 seconds. Elapsed time is 0.000023 seconds. I’ve never seen this way of using a scalar, mapping it to an array. Is there any passage in the documentation you could cite or explanation why and how precisely this works? @Alexander – using indexing to repeat array elements is such a standard technique for me that I didn’t even think twice about the fact that it may not be well known… This technique is used numerous times in the Matlab code corpus, although now that you asked I couldn’t find a direct doc reference for it (there probably is some reference, I just couldn’t find it). Here is an unofficial article that explains the use. thanks for the link. Indeed I’ve never seen this way of indexing befor and I’m sure I’ll use it in many places. Elapsed time is 0.000034 seconds. Thanks for putting this information up. To comment on the timings, I think they are too small to be measured correctly this way. You should run these commands in a loop for a couple thousand times to get timings into seconds, otherwise they will be influenced by context switching of your operating system. I doubt it matters if you use the zeroes command or direct indexing. As you say, the array gets initialized with zeroes either way (FALSE or ” are zeroes as well). Using different data types might cause a smaller number of bytes to be allocated and a smaller initialization time. That improvement is array size dependent and only happens above some matrix size, more info can be seen in a StackOverflow post I’ve recently posted. @Nathan – Thanks for the update. I think that a(1000,1000)=0; is simpler to use. IMHO, the potential minor extra saving by the product trick is not worth the extra complexity. Still, I admit it’s a very neat trick. Elapsed time is 0.007001 seconds. From data(1,1) to data(2346,2346), time is increasing linearly, and when reaching 2347×2347, execution time falls : 100 time faster. I’m wondering why is 2346 a “limit” … Weird ! Elapsed time is 0.189022 seconds. Elapsed time is 0.000471 seconds. @Marshall – indeed: the behavior changed in R2015b when the new LXE (Matlab’s new execution engine) replaced the previous engine. I can replicate this version difference since 2015b. The following observation may be interesting. If I open Windows Task Manager or Linux System Monitor to watch for memory usage, whenever the allocation (Matlab versions and zeros /end-referencing combinations) is slower, it involves increased memory usage, while the faster one does not. This suggests the faster one is using pre-allocated memory when Matlab starts. Any idea to take advantage of this? Thanks. I just upgraded from R2015a to R2015b and a MATLAB script I have that used to consume about 2.1 GB now consumes 4.6 GB of memory. That’s a big problem for me because I used to be able to run three copies of MATLAB in parallel with different parameter settings and now I can only run one on my 8 GB, 4 processor machine. You mentioned a new LXE above, and I’m wondering if that is the culprit and if anything can be done about it. If it’s faster than the old version, that’s great, but not if it uses way more memory. @Darrell, thank you for bringing this to our attention! Would it be possible for us to take a look at your code? Would you be open to connecting with us offline to discuss your use case? Feel free to email Anoush dot Najarian at mathworks dot com. Arash Marashian (12 days 14 hours ago): Problem Solved. I found out that my version does not have this icon. thanks. Marshall (13 days 17 hours ago): This was a fun puzzle–don’t hesitate to add more posts like these if you come across some other fun ones! GGa (15 days 17 hours ago): There isn’t anything “outside the UTF-8 range”. UTF-8 can represent any Unicode character, as far as I know.